PENTICTON, B.C. — Team World stopped some of the bleeding on Saturday afternoon at the World Financial Group Continental Cup, presented by Monsanto. 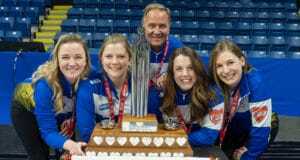 The host Team North America had won five straight sessions at the South Okanagan Events Centre in curling’s version of the Ryder Cup, but Team World was able to win one game and tie another in women’s team encounters on Saturday to split the three available points. That leaves Team North America with a still-healthy 17.5-9.5 lead in the overall points race; a total of 60 points are available, meaning the first team to 30.5 points will win the WFG Continental Cup, although Team World, as defending champion from last year’s event in Langley, B.C., would retain possession should the teams each win 30 points. Most of those points will be available in Sunday’s six skins games, which are worth five points apiece. 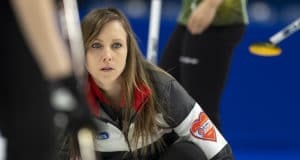 Team World’s Mirjam Ott (CC Davos, Davos, Switzerland) was able to stop the losing spell with a 6-2 win over Team North America’s Heather Nedohin (Saville Sports Centre, Edmonton, Alta.). Team North America’s Jennifer Jones (St. Vital CC, Winnipeg, Man.) answered back with a victory of her own, making a delicate come-around tapback to score two in the eighth end for a 5-4 win over Team World’s Eve Muirhead (Dunkeld CC, Dunkeld, Scotland). The winning shot made up for a narrow miss on her first delivery. In the third women’s game, Team North America’s Allison Pottinger (St. Paul CC, St. Paul, Minn.) and Team World’s Margaretha Sigfridsson (Skellefteå CK, Skellefteå, Sweden) played to a 5-5 tie, as the Swedes came back from an early 4-0 deficit. Pottinger said her team was looking forward to Sunday’s skins finales. The final men’s team session is scheduled for later on Saturday, beginning at 6:30 p.m. (all times PST). Matchups for Sunday’s skins games were determined following the afternoon draw, as Team North America captain Kelley Law (Coquitlam, B.C.) and coach Rick Lang (Thunder Bay, Ont. ), along with Team World captain David Hay (Perth, Scotland) and coach Peja Lindholm (Östersund, Sweden), set their lineups. The intriguing matchup will be at 5 p.m. with Kevin Martin (Saville Sports Centre, Edmonton, AB) skipping a mixed team that features Nedohin at third, Martin’s lead Ben Hebert playing second and Nedohin’s regular lead Laine Peters, taking on Muirhead, the four-time world junior women’s champion, with Greg Drummond (third for Tom Brewster, Curl Aberdeen, Aberdeen, Scotland), Vicki Adams (Muirhead’s second) and Michael Goodfellow (Brewster’s lead). Each side has won four Continental Cups.